American Fence Company Knocks it out of the Park Again! The Lincoln branch of American Fence Company was featured in the Lincoln Journal Star on Monday March 12, which you can read here. 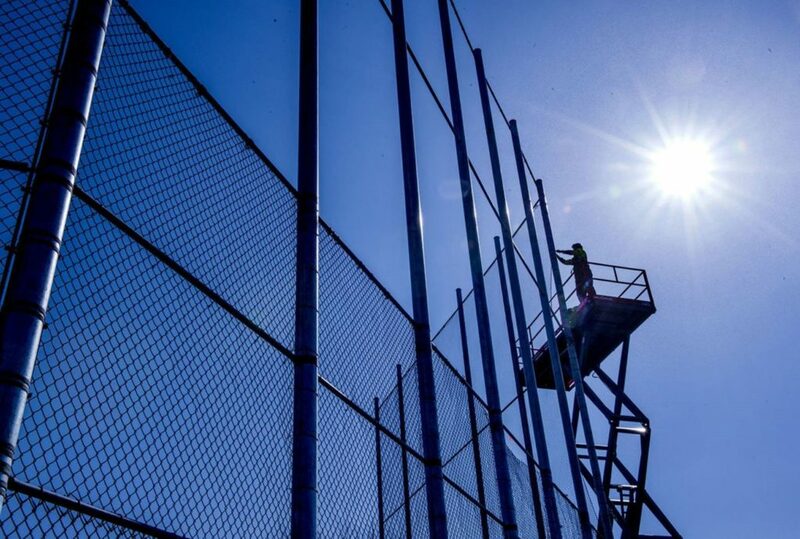 Ahead of Nebraska Wesleyan University’s first baseball game of the season, one of American Fence Company’s recent projects has been at Wesleyan Field, replacing all of the netting on their 40-foot backstop before their game against Northwestern College. AFC specializes in fencing, fence installation and fencing supplies. American Fence Company is one of the largest fence contractors in the Midwest, so projects like this are not out of the ordinary. Our workmanship can be found all over the U.S., including in Yellowstone National Park and at the Grand Canyon. We have done work for the baseball fields at the University of South Dakota and Creighton University, for the National Guard, a nuclear power plant, Eppley Airfield and the Air Force. If you’re in Lincoln or near one of our other locations in the Midwest and you are interested in getting some work done from American Fence Company, visit our web page for more examples of our work or contact us for a free installation quote.